Mummy Of 3 Diaries: #Win a Lilium Dining Table and Chairs (x2) from Wayfair. #Win a Lilium Dining Table and Chairs (x2) from Wayfair. Win a Lilium Dining Table and Chairs (x2) from Wayfair. The Lilium dining table and chair (set of two) bring a stylish and intimate dining and seating experience to any home. Made from real ash veneer with on oak stain finish, the set offers a neat and practical addition for a kitchen or dining room. The lovely people from Wayfair have given me this gorgeous set to giveaway away to one of you lovely readers. I'm excited for you, it's a gorgeous set. I know I would love to own it. The Lilium Dining Table offers a contemporary square dining table made from real ash veneer with on oak stain. It offers a simple, neat and practical addition for your kitchen or dining room. 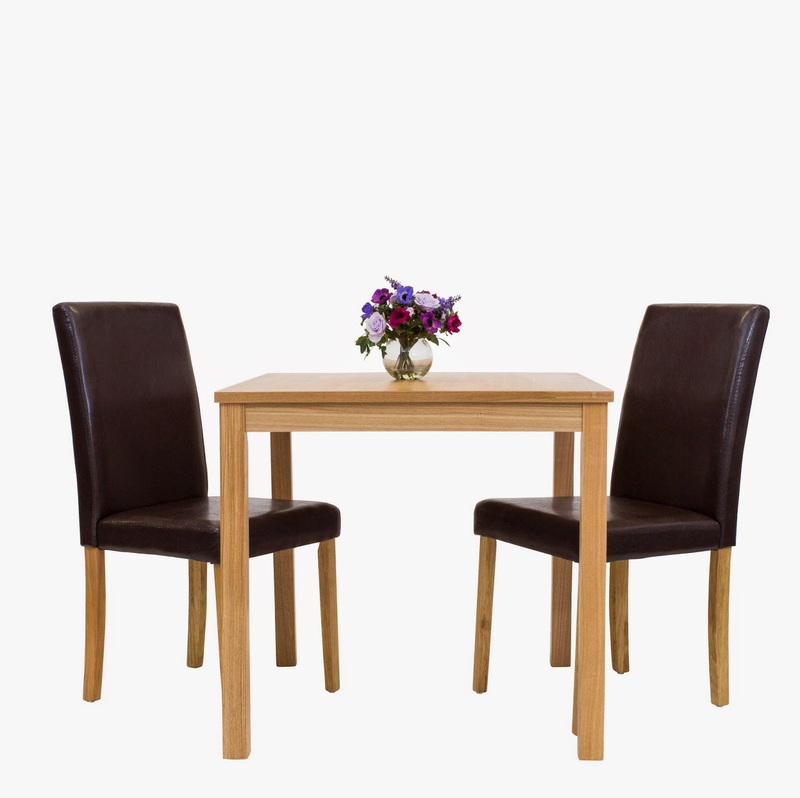 It's a beautiful 2-4 seater dining table made of real ash veneer with an oak stain finish. It would normally cost you £59.99 from the Wayfair site. The Lilium Dining Chair (Set of 2) are brown faux leather upholstered chairs, with legs made of real ash veneer with an oak stain. These dining chairs perfectly compliment the Lilium Dining table. They're a functional solution for small rooms and perfect for those romantic meals for two. They're a very lovely set, I really like them. To win this beautiful Lilium dining table and two chairs all you have to do is enter using the Rafflecopter Form below. Please allow a few seconds for it to load at busy times. it would fit nicely in my front room! They are stylish and modern and I love the fact they are made of real wood too! Thank you! I love how it looks so great and doesn't look cheap despite the fact its very reasonably priced. It's nice and square and doesn't take up too much room. It would fit the small space we have for a table.. perfect for my fiancee and I. Looks comfortable too! I love the size. It would be perfect for my daughter's dorm suite. Its size it will fit in the small space i have. It looks neat and compact and ideal for smaller spaces ... like my house. Love the style and the size. Traditional and will last forever! I love that it's only for 2 people so cute! We've just got rid our old table & chairs as it was too large so this would be perfect. I recently moved into my grandmas home, the dining room was made into a bedroom, my lovely big table had to go. I would love this table as that would fit in our long lounge, this is perfect. Its elegant and more chairs can be added which is good. Its a wonderful size and very stylish. It would fit in our house ! The chairs look classy, comfy and wipeable. It looks like the table probably doesn't wobble, which is an improvement on my current one? It also goes with most every room. It would give my dining room a contemporary look! good size for a small kitchen! That the chairs are completely wipeable! I love the style, its really elegant and the size is great. It is an ideal size for our room and great quality. Good luck everyone. Could do with a nice small new table to replace my battered and bruised one from the early 70's. Lol. This looks good but I really like the size. It would fit in our living room so could be used to work on or for a later dinner for just me and husband (where we could break the rules and have the TV on!). It looks so compact. Perfect for a small kitchen. Love the oak finish, would look lovely in my dining room :). This set would fit perfectly in our kitchen. I like the simple design and the chairs look comfortable too. We were looking for a set just the other week at the Homebase sale. Unfortunately couldn`t afford any of them so had to leave empty handed. It's compact so would fit into a smaller space than most! I love the oak stain finish. Most of the furniture in my house is oak, so this matches it all perfectly. Compact and would fit in my conservatory! It's stylish and we could fit this in our kitchen! Its compact but still looks lovely, it would be great in my kitchen! I'm moving home with my partner and this would be a perfect addition! It's stylish and looks like a great space saver! It looks very stylish and modern, I love it. I love the woodeness! We have a glass table atm and it is a nightmare to keep clean! I cant wait to get rid of it! The size... our one at the minute is way too big. It is the perfect size for my lounge. The size, my Mum has been looking for something just like this it would fit perfectly in her kitchen. It's a perfect match for my kitchen! It will fit in my small kitchen very nicely. It's a practical size and would fit perfectly in my kitchen, we have a large table at the moment and have to move it around the room to get in the bottom cupboards. It looks really modern without being too modern. It is also very stylish! Look great quality, and robust. I love it all. I've wanted a set like this for a long time. Just what I'm looking for, great for a Craft Table and Homework Table... infact it's 'That Table' multi purpose. it's a fantastic compact size. Perfect for a little space! The colour and the size. I've just moved into a new home and this be lovely for my partner and I to use for having our breakfast together. It has clean classic lines and it is stylish! It's not too big, which is good because it needs to be able to fit in my tiny kitchen! It's stylish, compact and space saving! I love how simple & chic the chairs are. Looks quite small and compact - my flat is quite small so looks like it would fit nicely! It's great for fitting in small spaces and looks lovely. Stylish and leather seats are perfect as they are wipeable! The colour the style there just classy ! !